Lobo Urban Stay, Sao Paulo, Brazylia : Rezerwuj teraz! 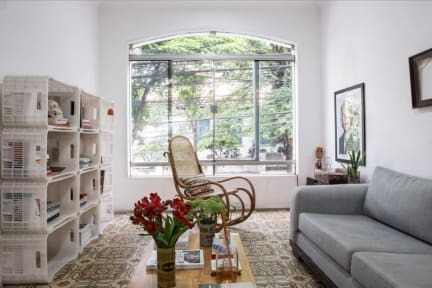 Lobo Urban Stay is a charming and cozy guesthouse located in the privileged center of São Paulo. The traditional neighborhood of Jardins is three blocks from Paulista Ave. and a hub for dining and shopping. You will stay near to the subway, bus stop, bike rental stations (shared bike) and everything else you need, such as the city's best restaurants, shops, night clubs, banks, ATMs, etc. We offer both private and shared rooms with staff in attendance 24/7. Our goal is to help you experience São Paulo as if you were a local and will help you in any way we can to ensure your stay is unique. The room has a double bed, bedside table, a big wardrobe, a table and a bench. It has a private bathroom with electric shower. We provide clean towels and linen. The shared room has 04 bunk beds (8 people) and lockers. In addition, it also has a nice balcony. The room is a suite with a shared bathroom with electric shower. We provide clean sheets. The female dorm has 2 bunk beds (04 single beds), lockers and a desk. It also has a bathroom. We provide clean towels, blanket and linen. Please, is very important that you tell us what time you will arrive in the house. Send us an email or you can call or sms.